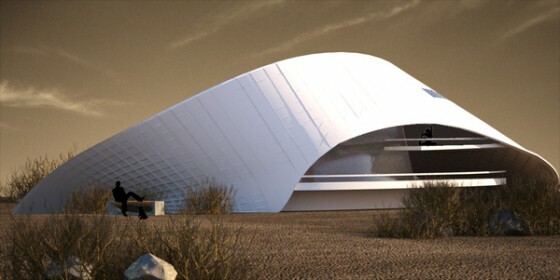 A team of Iranian students won a prestigious design competition with this cool desert dwelling! 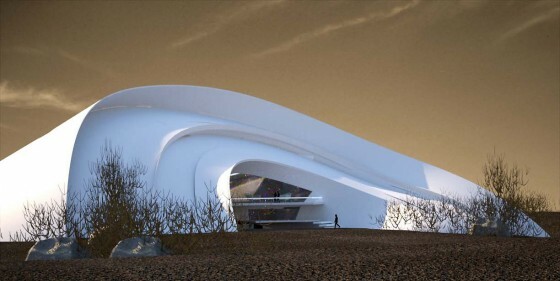 If you think this curvy desert dwelling looks a bit like a snail, then you definitely aren’t going crazy! 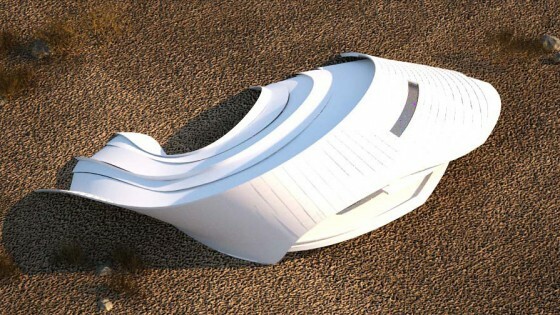 Tasked by the Biomimicry Institute’s Student Design Challenge with finding solutions to every day challenges by looking to nature, Elnaz Amiri, Hesam Andalib, Roza Atarod, and M-amin Mohamad from the Art University of Isfahan in Iran decided to design a house that is self-cooling – just like a snail. Step into our lair for more details about this very – ahem – cool home. To mimic the curvature of the snail’s shell, the students created crescent shaped panels that overlap one another. These prevent excess sunlight from penetrating the interior and its off-white color is thought to reflect sunlight. Like the snail, which retreats far into the depths of its shell when the sun blazes, residents of this desert dwelling (if it is built) can escape the heat by tunneling further into the building’s recess. The further the reach, the cooler the interior – like a cave. In case this sounds too good to be true, the students tested their ideas using Ecotect Building Analysis. Unsurprisingly, they found that the design works and the home would be perfectly comfortable without air conditioning in even the most formidable heat. And we would be remiss if we didn’t mention how exciting it is for Iranian designers to win such a respected prize when the rest of the world is waiting with bated breath for the country to self-destruct. Biomimicry is slowly gaining momentum in the Middle East. Two Egyptian women have designed eco-tours that encourage students to look to the camel and scorpions and other desert animals for solutions to modern issues. And last year we interviewed one of the foremost leaders in the biomimicry field, Melissa Sterry, who shared a few mind-blowing concepts that could easily be adapted in the Middle East. But biomimicry’s most compelling advantage might be that in order to achieve the kind of pre-industrial efficiency and sustainability demonstrated by our ancestors, it might not be necessary for all of us to live in cob buildings and eat roots. We can move into the next era by combining nature’s prowess with our own technological might. Within reason. I think it is not fair to steal the concept of other architects.I presented my theses in that university in 2007 and today I saw that some people used all my studying without mention about the resources .I will complain about this matter just because I am working on it in aus university. ALL THE BEST FOR YOUR PROJECT FROM AN ARCHITECTURE TEACHER IN ISRAEl-ןi wish you could cooperate with israeli students working on ecological /green architecture! maybe in the future, when a peace loving and israel accepting regime will be in IRAN!